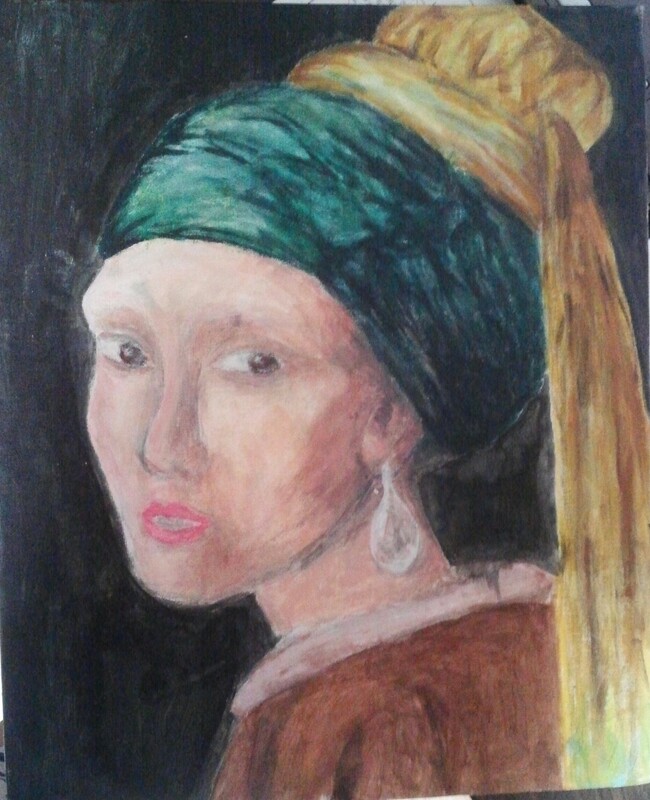 Today I found my finished oil painting-my altered version of Dutch painter Johannes Vermeer’s Girl with a Pearl Earring. In my painting the ‘girl’ looks more like an old lady… I actually didn’t intend for her to look like that but I’m just telling everyone that I did it on purpose. I painted the headscarf a greener shade than the original, because I thought it would contribute to a more mystical atmosphere. Her lips are painted pinker than the original. I wanted her to have a weird, modern edge. It didn’t turn out exactly as I had planned, but oh well. In my defense, I’m more of a watercolor person. This was the first time I had ever done a proper oil painting on a canvas. I guess it’s an okay-ish first try? Right..?! I like it! Thanks for the follow! looks very nice, that too on a first attempt! Wow! That’s good. I draw people at all. Oh I mean to say I can’t draw people at all! It gets better with practice, I guess. I can’t draw animals! I love the way her eyes look! I feel you did a great job! Thank you so much! : D I’m glad you like it. Thanks for stopping by my blog! Thanks! : ) I hope you enjoy reading my blog! You’re so sweet! : ) Thank you! I sent the link to your blog to my daughter as she loves fashion and art and is a kpop fan. of course I don’t know if you’re a fan too but she loves all things South Korean so just a guess that she’d love your blog. happy weekend to you!! Wow, I’m flattered! : D I hope she likes my blog! I’m a big fan of Big Bang and 2NE1(Does she know them?). Have a wonderful day, and thank you for stopping by here!